The 1,000 year commemorations for the Battle of Clontarf are taking place across a number of days in 2014, which brings up the question from a few of our @1014retold: on what day was the actual battle? Like much of the information we have about the battle, the actual date itself is not known with 100% certainty and is the subject of some debate. However there are good reasons to believe that it did take place on Good Friday, and many historians concur. 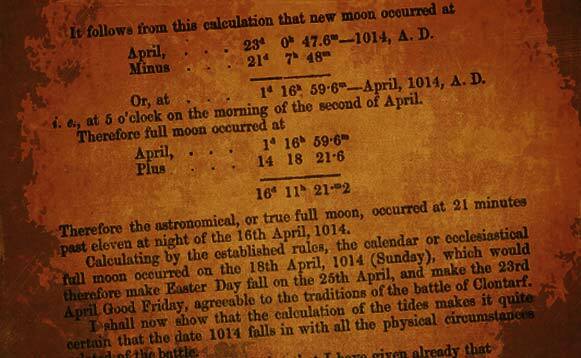 In 1861, Samuel Haughton worked out the nearest full moon and the associated tides for the assumed battle period in 1014. (Haughton’s calculations can be seen in his book freely available on Google Play). So one valid approach, which many festivals and events have taken, is to celebrate the anniversary of the battle on Good Friday 2014, which was the 18th of April, and to carry on the celebrations and events throughout the modern Easter Bank Holiday weekend. On the other hand, Good Friday fell on the 23rd of April in 1014, and this is the date we have used for our Twitter timeline. In 2014, the 23rd of April is actually the Wednesday following the Easter weekend. So if you wish to keep the Clontarf spirit alive for a little while longer, our battle day isn’t for a few days yet. Plenty of time to get retweeting your favourite Clontarf character in the Game of Tweets! Sure, haven’t they changed the dates so that we skipped a two-week period back in the seventeenth/eighteenth century? Any choice of dates is immaterial. I think the 1014retold date is more accurate for us secularists! Back in the day, it might’ve been more appropriate to pick the Good Friday date. Great, great, great project.